If you see any products that appear on the Caswell Inc site that are not listed on our site please e-mail us to help you further with your enquiry. We are in the process of constantly updating the NEW on-line shop. Abrasive optical grade Cerium powder, the finest glass polishing compound available. 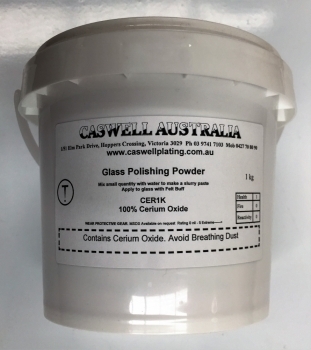 Testimonial - I purchased your glass polishing kit that comes with cerium oxide and a buffing wheel to put into a drill. It worked great. I had an interior door that I was finishing and accidentally slipped with 120 grit sand paper off the wood and scuffed the glass. I taped everything off and worked the polish for about an hour and a half and it looks good. I had the privacy frosting on the back side so that helped. But the kit I purchased from you guys was great. Couldn't be happier. Testimonial - The product worked better than I had expected. I have a wood burning stove and after a period of time the ceramic glass gets cloudy and no amount of cleaning will remove it. The company that makes the stove says there is nothing you can do about this, but they sell new glass and it's not cheap. Using your product was an inexpensive way to try to clear up the glass. It took a while to do, but it looks like a new piece of glass. I have plenty of powder left for more glass work. © 2019 - Caswell Australia. All rights reserved.